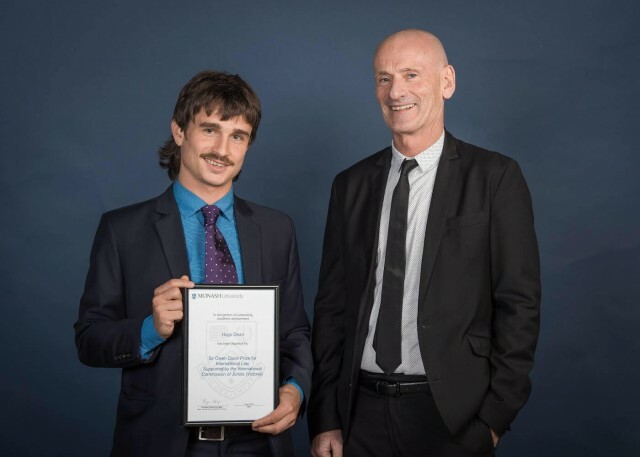 The winner of the ICJ sponsored 2018 Monash University International Law Prize, Hugo Dean, studied International Human Rights Law, Law of Armed Conflict, Refugee Law and Environmental Law before taking the broader elective, International Law. In a History major he had studied Cold War era politics, World War II and the ongoing conflict between Israel and Palestine. As a result, he was able to draw upon various elements to focus on issues of enforceability of custom, treaties and diplomacy as well as the functionality of international organisations such as the UN and ICJ. Comparing the global community’s response in the Serbia/Croatia conflict during the mid 90s with the border tensions currently occurring on Russia’s Ukrainian, Georgian and Crimean borders led him to gain a new appreciation for the power of ‘soft law’ and the ability for consensus and cooperation amongst States in the global community to achieve results more effectively than organisations attempting to enforce specific treaties. Hugo is also an accomplished musician. This talent, with a clerkship at Media Arts Lawyers, has led him to his current role as content producer/project manager for music website LNWY.CO – a joint venture between St Jerome’s Laneway Festival and Bolster Digital.